With World Cup quality performance on their side, Spank developed their Spike Race Bar with the help of their pros. This handlebar is the 5th generation of the Spike Race handlebar legacy, developed in coordination with some of the world's top DH and Enduro pros. A unique construction of Super 6 alloy, processed with Spank's patented CNC bending and Dual-Extreme-Gradual Taper (XGT) technology makes the Spike 800 Race handlebar a stronger, safer, performance optimized component for the weight conscious gravity rider. The race tuned geometry and competitive weight make this bar the perfect option for All-Mountain, Enduro, and Gravity racers. had hand pain after a full day of riding DH on fairly steep terrain. 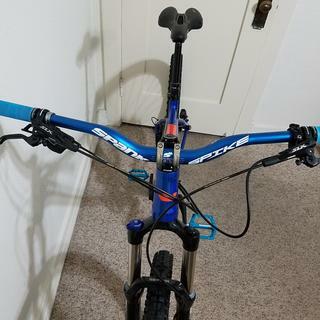 bought these riser bars, and hands are tip-top. Love it. Got it because the price was great. Cut the bars down 15mm on each end and they're perfect. Recommend 100%. Awesome bars. Love the rise and sweep. Would recommend for sure. I've had other bars, like the diety topsoil. 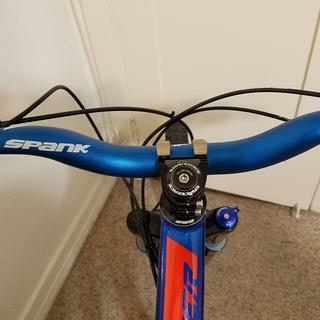 I wound up cutting those down, a bit too far, I know, measure twice..ect..Anyway, I wanted some blue anodized bars, and saw the Spank bars in 800 mm width, so I bought the, I have a bad back, so a more upright sitting position, when I sit..even when standing, the rise and backsweep, help, and they look great, at least to me..haha. Easy install, as they have marks to help you not only rotate, but to center them too. I'd for sure buy these again.. Needed a little more height in the cockpit... 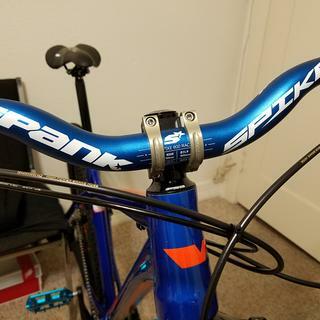 Bars were delivered extremely fast a + Spank makes awesome equipment, the spike bars are no exception very happy. these bars are the tallest i could find and suit my posture great. they are awesome solid and look great.